Do you have a random stack of assorted cupcake liners in your cupboard? I find they’re sold like hamburger and hot dog buns – they never quite match up to how many hamburgers and hot dogs you’ve made. 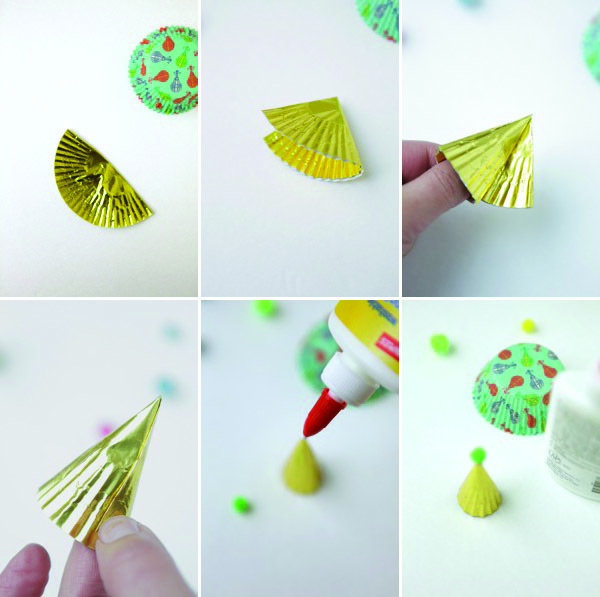 Here’s a cute and easy use for them – mini party hat cupcake toppers. Click through for full instructions! 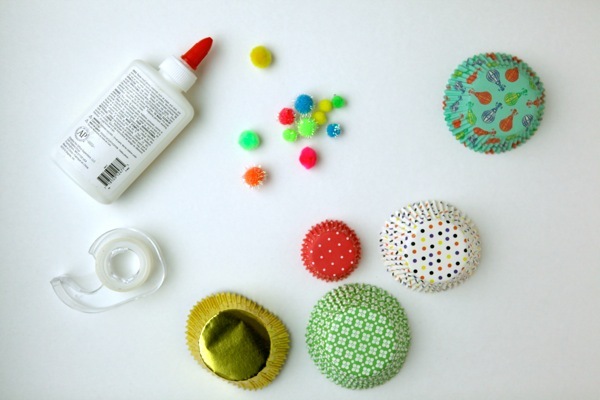 Materials needed: assorted cupcake liners, double-stick tape, glue, pom-poms. Step 1: Flatten a cupcake liner in half. Then fold it in half again to find where the point should be. Step 2: Gently twist the liner into a hat shape and secure it with a small piece of double-stick tape. Press firmly to seal. Step 3: Add a dollop of glue to the tip of the hat and gently place a pom-pom on top. Let dry. Step 4: Place the mini hats on your frosted cupcakes. Enjoy! These are adaptable to any kind of party, depending on the colors or liners you have –a friend of mine did these in silver foil with a little gold star on top for her son’s wizard-themed party. 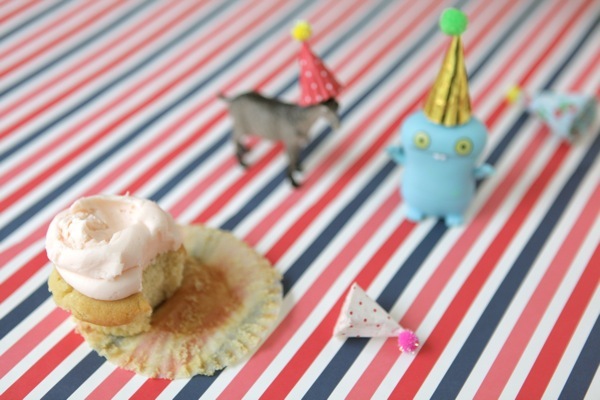 And of course, they are the perfect size for toy animals and funny characters once the cupcakes have been eaten. These are A-DO-RA-BLE !!!!! LOVE ! Perfect timing! We’re hosting a little party at the house on Saturday and I was looking for just this sort of easy but fun idea. Also, how funny that out of four commenters so far, two are Aimee?! Goodness we think alike, I would have put that hat on every single one of my sons toys!! Love these! Thank you. They are perfect for a small person’s party. What a cute idea! Love it! Makes the cupcakes look so adorable! Very cute — great use of assorted cupcake holders!! brilliant! absolutely brilliant ; ) i’ll be using this DIY for my daughter first birthday party next week! 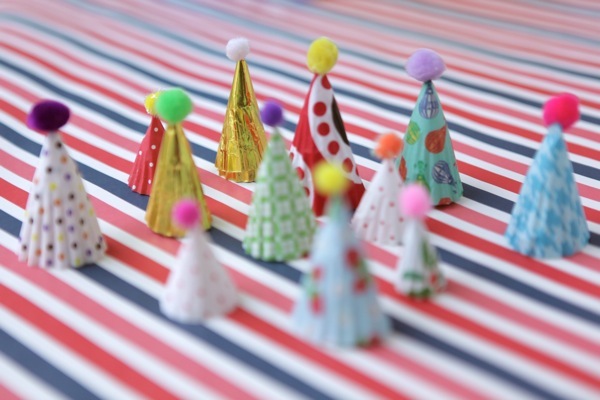 These are too cute and so festive. What a great way to add cheer. Never too early to start planning for Ezra’s first birthday! Love your creativity and originality. Would be good for NYE as well (another celebration heavy on the hat-wearing). So sweet. 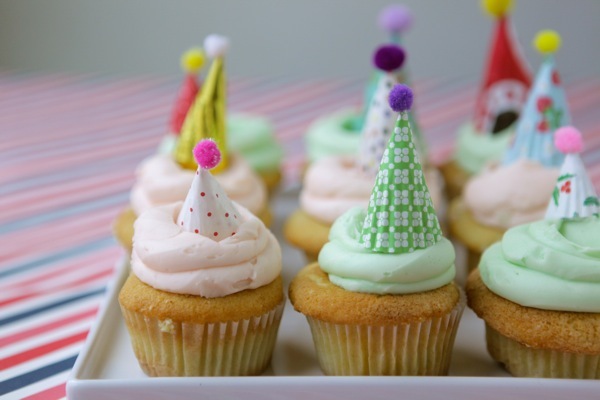 We’re having a Golden Globes party on Sunday so I might have to try these with gold foil! so smart & so cute! Cute! What a lovely idea! I never did know what to do with those. What a wonderful idea I need to get baking! Such a great idea… I’m doing this! oh chiara this is super cute!! Love it! Perfect for my kids’ birthday party next month! These are perfect. Now, if someone can just deliver the hats COMPLETE with the cupcakes, I’m all set! Genius! And utterly, outrageously adorable. What a clever way to use up those stray cupcake liners. So cute….totally going to do this, thank you!! Mini hats are cute on anything! Love! These are so stinkin cute!!! Love it! Brilliant! I love these and just pinned them. 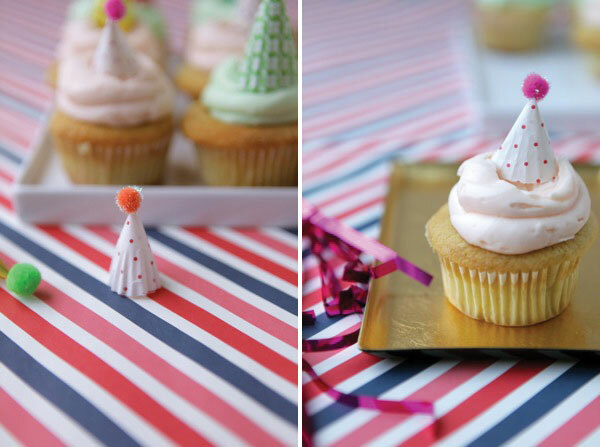 Love these little cupcake toppers, they are so cute. I have recently begun blogging and am doing a different challenge or task each month. January is DIY month. I have done a few things already and plan on making my own pillows this week. Your ideas are great and I hope my blog will bloom into something like yours has. Great job!